If the only Greek food you’ve ever had is a gyro, you are missing out. Big time. Nothing beats homemade when it comes to Grecian Chicken, and I’ve swiped this recipe from my near-lifelong-friend’s Greek family. Do you know what that means? It means it’s as authentic as it gets. The gentle seasonings let the flavor of the fall-off-the-bone tender meat come through. This recipe is easy enough that it can make a regular appearance at your dinner table. Read on to learn why. 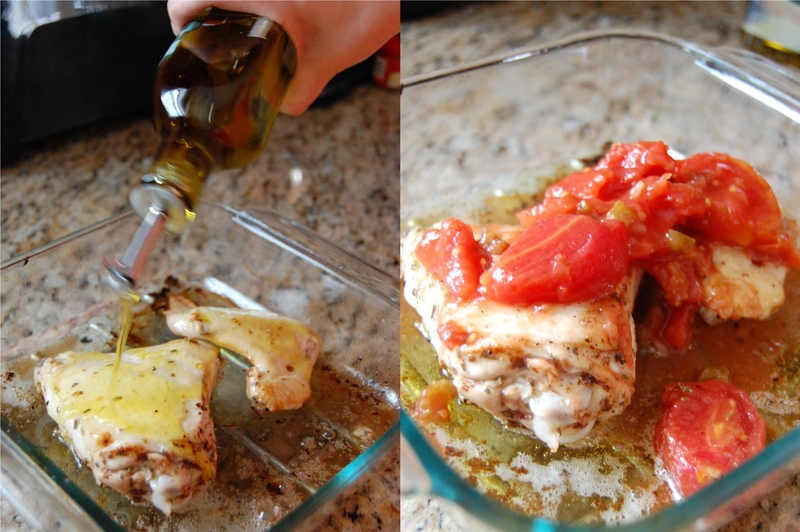 A Greek recipe that calls for olive oil, lemon juice, and oregano?! Shocking! Does sarcasm translate well over a blog? Because that statement should have been dripping with it. Though the cook time for this meal is relatively long, it is actually not much work at all because you don’t have to stand over the oven. It’s also extremely difficult to screw this one up. I’m including the measurements for the ingredients, but this family cooks like I do – by eyeballing it – so what’s listed here is all an estimate. It’s tough to go overboard with the lemon juice and olive oil here – you can be as generous as you like, just don’t go so far overboard that you make some kind of weird soup. You can, of course, use homemade stewed tomatoes. I reach for the canned ones because they are a time saver, obviously. I can’t tell the difference, but maybe you’re a tomato aficionado and that makes you quite particular. We all have our thing. Stick the potatoes in a separate baking dish and throw them into the oven as you’re putting the chicken in for its second round of bake time. Use the juices from the primary dish to baste both the chicken and the potatoes (if you’re making them) two to three times. It’s fair to use the phrase “easy peasy lemon squeezy” to refer to an easy recipe that actually calls for squeezing a lemon, right? 1. Preheat oven to 400 degrees F. Combine lemon juice, salt, and oregano and rub into both sides of chicken. 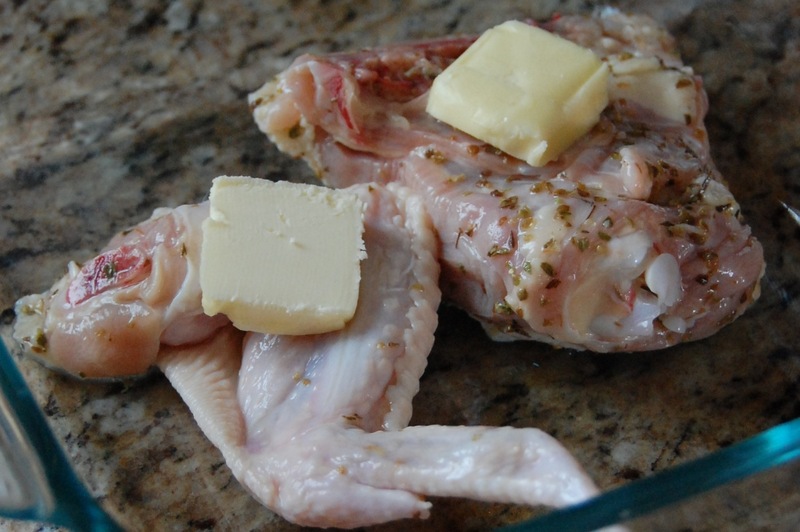 Place skin side down in baking pan and dot with butter. 3. Remove baking dish from oven and turn chicken skin side up. Drizzle with olive oil and sprinkle with pepper. 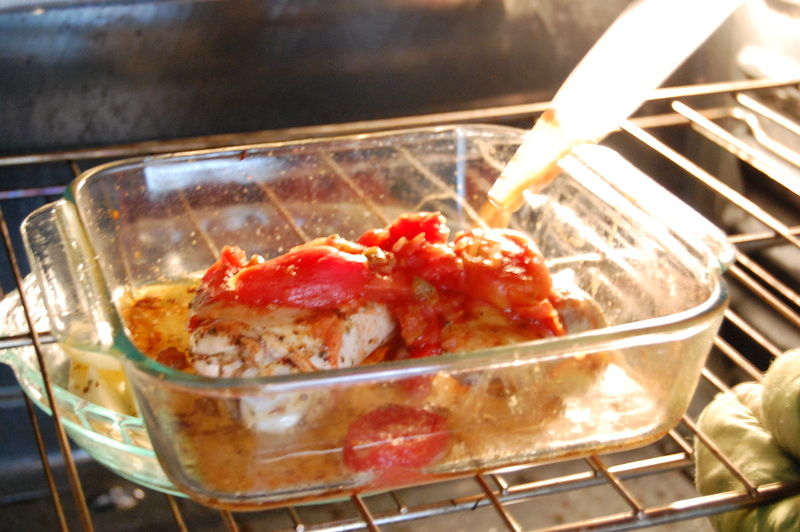 Pour tomatoes over chicken and return to oven. 4. Bake for an additional 30 minutes (or until done), basting occasionally with the liquid in the pan. If preparing potatoes, liquid can be used to baste them, as well, though this is optional. 1. Preheat oven to 400 degrees F. Peel potatoes and cut into wedges of equal size. 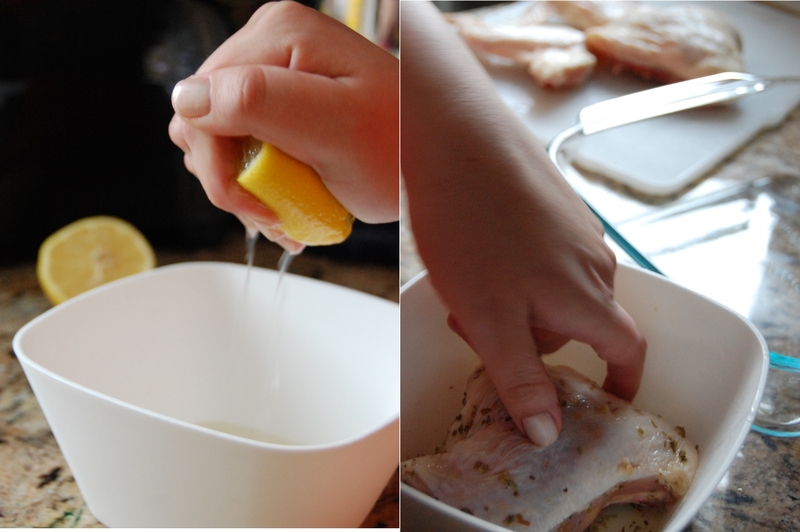 Arrange in baking dish and drizzle with lemon juice and then with olive oil. Mix by hand until wedges are coated thoroughly. Sprinkle with salt and pepper. 2. Bake for 30 minutes or until tender. 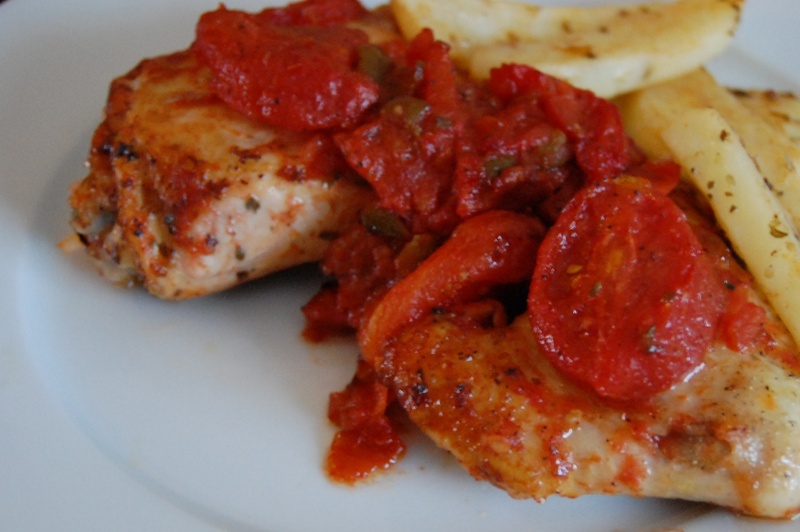 Optional: if preparing with Greek Style Chicken, baste potatoes 2 to 3 times with liquid from chicken pan while baking. 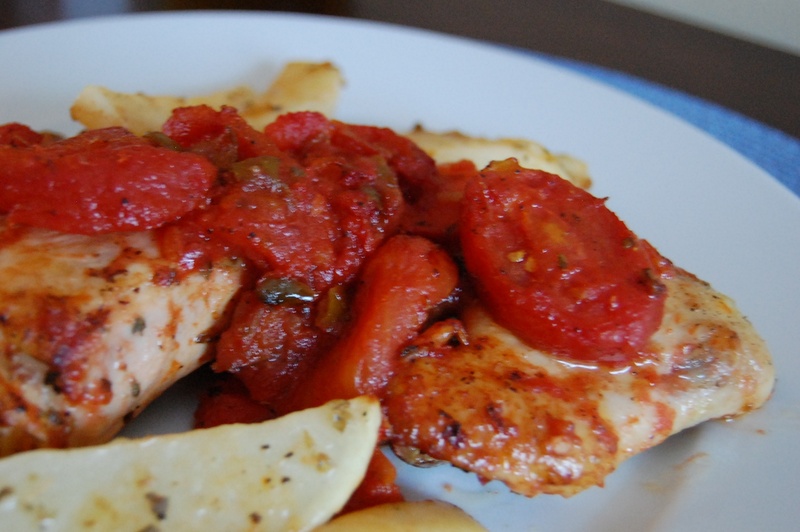 This entry was posted in Chicken, Dinner and tagged Baked, Chicken, Cook Time, Cooking, Dinner, Greek, Healthy, Prep Time, Recipe, Yield by Lazy Suzan. Bookmark the permalink. I love meals like this that are super easy. Looks so delish! Me too! Throw it all in a baking dish and let it go. So simple. This looks great! Lemon squeezy all the way. Ill try it this weekend. Thanks for the “like” on my blog. This recipe looks awesome!